Slå publikum, og få tidlig tilgang til Park Güell i Barcelona. Utforsk de fantastiske kreasjonene til Antoni Gaudí før parken blir for fullpakket med folk. Tilbring tid med å forundre Hall of Columns, en mosaikkhøvdingstatue, vakkert planlagte viadukter og portikaler, og storybook-like gatehouses. Vær forberedt på å få en tidlig start med denne turen, men vet det er vel verdt det. Møt gruppen din klokka 07:50 på stedet gitt til deg på tidspunktet for kassen. 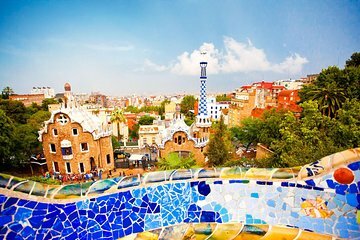 På Park Güell, unnslippe inngangslinjene, og følg guiden din inn i parken - gruppen din vil være noen av de aller første menneskene inne i parken den dagen. Hold øye med den berømte mosaikkbelagte dragen ved inngangssteget og de imponerende historiebok-lignende gatehusene. Gå langs hageløypene, siden din guide snakker deg om historien og inspirasjonen bak skapelsene gjort av Antoni Gaudi. Se Hall of Columns og den øvre terrassen foret med en svingete mosaikkbenk. Sprøyt ut mer av Gaudis arbeider som en mosaikkøvelstatue og andre vakkert planlagte viadukter, portikaler, bygninger og statuer. 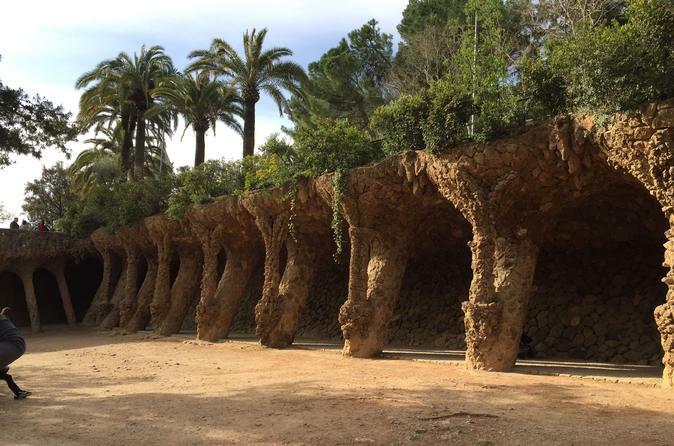 Turen slutter i parken, slik at du kan bestemme om du vil bli og utforske - husk, du har tilgang til Park Güell hele dagen. Tour of the park was great and the guide was helpful. Park Guell is absolutely stunning with the mosaic structures surrounded by the beautiful gardens. We arrived for our fast track access to the park at around 7:30am. We were of the belief that we had early access to beat the general admission and the crowds. When we turned up, the gate was already open and people were just wandering in and taking photos, without paying an entry fee. We waited for our guide and we entered the park at 8am. By this time there was already hundreds of people who had accessed the park for free. Our guide had a basic knowledge of the park, which we could have gotten from the brochure. We paid for an English speaking tour but found out it was a shared tour with Spanish speaking, which delayed the tour. The guide did not want us to take many photos as this would hold her up for her next tour at Sagrada Familia. So once the tour was over we could then go back and try and get some photos. I do not believe this was value for money as I could have gone to the park early and gotten free entry with clear photos without the crowd. Excellent introduction to Gaudi's work and also the history of the park. The guide was knowledgeable, pleasant and answered all questions-excellent value. Not enough infos to locate main Entrance, so we missed the Tour but got in any ways. Mainly in renovations. Much less to see and much smaller than expected. Deception. This park is amazing! Victor, our tour guide, was very interesting and fun! The sites of this park are a must do! This is by far the best park I've ever been to! The all around structures are breathtaking. Antoni Gaudí was a genius ahead of his time. Although I not sure about paying for early access as the park was filled with visitors during this time who didn't pay. Our tour guide was well versed in her information, but lacked a bit of the enthusiasm we were expecting. Might have had something to do with the awful family that we were in the group with, but nevertheless we learned a lot and came to appreciate Gaudi more after viewing the park. 9 am. The idea of creating the first 'gated community' for workers and the new middle class was sadly not completed. colorful use of tile to restore our garden at home... recently destroyed by hurricane. Thanks! J and R Naples Florida. The only glitch was finding the place to meet the knowledgeable guide. Location needs to be clarified at the local level.